Turning down a one-way alley towards SuperGiant's downtown San Francisco office space, I noticed the fenced parking lots on either corner decorated with two sorts of barbed wire. Three classical, no nonsense parallel strands were circumscribed by much more lively spirals of metal like a sharpened, stretched out slinky. This is the coveted San Francisco startup space over two million Bastion sales led to. Atypical out of the gate success that the team doesn't take for granted. The move from the sleepy San Jose suburb that bore Bastion to an urban hotbed would, perhaps by coincidence, bear Transistor, SuperGiant's next project. 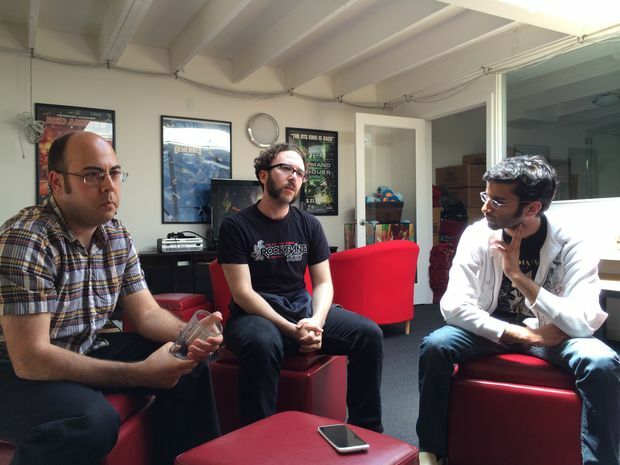 We sat down with Supergiant's Amir Rao (co-founder), Greg Kasavin (writer), Jen Zee (artist), and Darren Korb (composer) -- on Rao's dad's old, burgundy couch from the San Jose house -- after development on Transistor had wrapped, while the team was prepping it for launch. There was something of a calm in the air walking into the modern, open floor plan office, past the kitchen and fuzzy knoll of Bastion plushies that topped a long counter top. Visiting a studio that makes videogames, you always sort of expect to crawl into some hidey-hole of digital wizardry (and with the indies, you breathe a sigh of relief they haven't burnt the place down and have properly filled out the papers on their commercial lease), but it's people at knickknack decorated desks with enough monitors to watch the entirety of True Detective simultaneously. 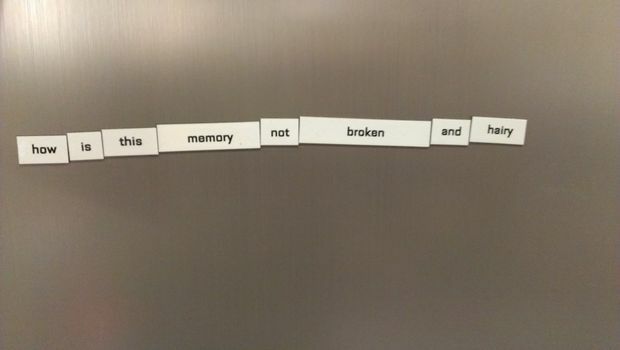 On our way upstairs, passing the fridge, I noticed word magnets arranged to read, "how is this memory not broken and hairy." "Not that it's calm right now," Kasavin, Transistor's writer, explained, "but it definitely sort of feels like we're in the eye of the storm and things are about to get crazy for us one way or another." The team is focusing on "rubber stamping," doing all the small things that need to be done leading up to release, including three regions of certification on the Sony side and getting review codes out. "It's plenty of work but it's sort of finite and there are often dependencies on people outside of this studio so you can't necessarily work all night." 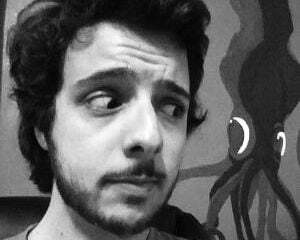 "You could," Korb, Transistor's composer and sound designer, interjects. "I guess Amir has had some late nights talking to Sony people in Europe," Kasavin said. "Waking up at 3am so he can talk to Europe," Korb said. Of course, getting to this point of relative calm was a long time coming after years of development and the explosive sprint to the finish. "Crunch time," as it has become known with increasingly negative connotation. "I think people have different understandings of what crunch is," Kasavin said. "Some people define it as a mandated work schedule. Like, when there's a decree from the executive producer, 'Our new work hours are 10am to 9pm, seven days a week.' Where I first met Amir and Gavin, we were at EA and we were on the 'EA Spouse' team, which was one of the extreme cases of crunch. "But there is never a mandated crunch on this project, which was very important to us going in because we pushed ourselves really hard at the end of Bastion and we really want to do this for the long haul and that means not burning the candle at both ends and taking the time you need. At the same time...we don't release games very often so I think we all feel individually very motivated to push at the end because we can rest after it comes out. For the last few months, the game is at a point where every waking moment, you can do something to potentially make it better. "But we've all been through it multiple times and been through it once together as a team so we have a pretty good sense of what our own limits are and when we get to the point of diminishing returns of like, 'dude, you're terrible to work with and making tons of mistakes, chill out.' I don't think we’ve ever had someone reach that kind of point on this project. "Some would argue it's still like crunch. [That] if you're working weekends and you're working past five, you're mismanaging your project. I don't see it that way." "We take each others' feedback on the team and constantly create a lot of work for each other by giving feedback. Some would call it feature creep or whatever, but we see it as giving feedback and improving and iterating on what's there...I think we all really don't want to disappoint each other as it were. So when little things come up we make time for them and that sometimes means working long hours...How this game does is going to affect my life for a long time one way or another so I see it as being in my best interest to do whatever I can to make this game as good as I can as an individual. Fortunately, my wife is forgiving of that." "I feel the same way," Korb said. "If we were to not do everything we could at this point, I'd be letting myself down. Ultimately one of the things I think we want to do is to make stuff that we enjoy and think is cool, right?" Just having the opportunity to try is something Kasavin notes SuperGiant is "in a very privileged position to do" following Bastion's success. "We came from...environments where you’re basically never going to get a shot at making your own original IP. That’s the game designer's dream scenario. Everyone's got an idea of what they would make. We were able to actually do that. Very few studios, big or small, have a chance to do that sort of thing so it's just like, you wanna keep that going." And forward momentum seems to be the way to do that without getting bogged down in concerns of marketability. Build something cool that you like and you can find an audience. "I was personally very bullish on it as a strategy," Kasavin said. "Put it in an environment where people can just play it and then see what happens. My own take on it is that if the game is not ready to be played, then it is not ready to be announced." It's about getting a representative sample and letting players have at it, rather than announcements and first hands-ons 18 months later. "I used to work in the gaming press and it was really frustrating to me. I don't know if it's real. Is it just smoke and mirrors? I want to know if it's a real videogame." That's why Transistor popped up out of the ether one day, when it was ready. "We actually didn't really know what the scope of [Bastion's] success would be or where we would end up or how much time we would have to make the second project until much later," Kasavin said. "Yeah it took a while for us to really comprehend the scope of what Bastion had become for a lot of people. For us, our concerns were much more material," Rao, Transistor's director, said. "More like, 'we're living in my dad's house, it would be good to live not here and work not in this place.' And so we were really interested in, okay can we get an office space and learning about whatever a commercial lease is, moving the company out of San Jose and into San Francisco. That all took months. "There was the PC version of the game on Steam and Mac and Linux and there was just a lot of Bastion stuff still happening. The iPad version took a long time for us. 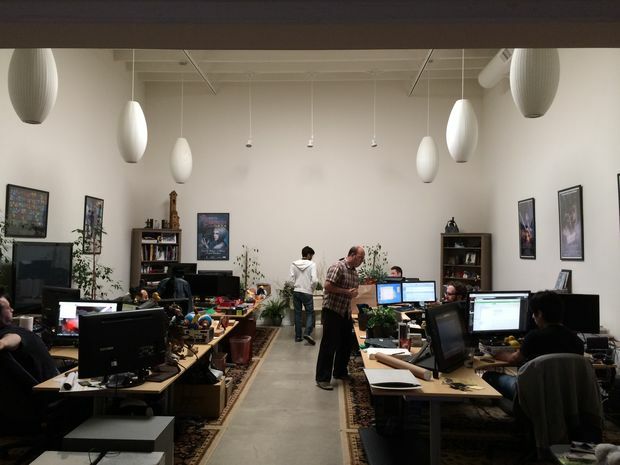 We understood more of what Bastion was when we were working on the iPad version. I think that realization was a slow dawn upon us and it came with heavy expectations of what we would have to do next. It was actually kind of interesting that this project was more born from a tail end or during the tail end of that time where we still didn't really really know what Bastion was." "We came to a point where it's like, ‘what do we want to do from here? We don't want to just bring Bastion to new platforms for the rest of our lives,'" Kasavin said. "Though we did do that for a while," Rao noted. "People are sometimes surprised to hear...we don't plan the next thing at the tail end of whatever we're doing. We like to take some time and space," Rao said. "It's almost taboo," Kasavin said. "Your mind goes there naturally. At this point, we're hardly working on the game itself anymore so your mind starts to go there: 'what do you want to...?' No, no, no. Don't let your mind go there because we need to launch this game. Whatever you think you want to do right now, you may be totally, totally wrong." Especially as you distance yourself from what you've been working on. "I have children, I can say you love the stuff almost like you love your kids, but you kind of, by the end, you want to be done," Kasavin said. "You want to send your kid off to boarding school," Korb added. "Yes, go to the military," Kasavin said. "Enjoy your time in the armed forces and do your country proud, thank you. You don’t want to plan the next thing from that mindset. People are like, 'so, are you going to do a sequel?' And we can't help but laugh." "It's really nice, too, because you don't have to keep secrets," Rao said. "Because we literally have no idea." Transistor did squirm its way out of this primordial, rested and distanced brain meld eventually, and with part II of this series we'll get a more detailed look on Transistor development decisions, games that influenced Transistor and the SuperGiant team (start guessing in the comments), and San Jose's sleepy car jacking.